On one of the first mornings after I’d just moved to China in 2007, I was awoken at 6am to People’s Liberation Army marching songs being belted out by university freshmen. When I walked outside, I was taken aback by the droves of students decked out in camouflage intently walking in lock stop – that is, before they saw me and broke out into giggles. Ever since then, I’ve been more intrigued by Junxun than just about anything else I’ve seen during my stay in China. Junxun refers to the military training all Chinese university freshmen must go through when starting college. What’s intrigued me is how in many ways it seems to be a microcosm of how Chinese youth today both embrace and subconsciously resist the carrots and sticks that the Communist Party uses to keep their support. Every few months China has some kind of territorial spat with one of its neighbors – be it Japan, the Philippines or Vietnam – that gets everybody worried about war. As I was standing amidst the unusually vitriolic anti-Japanese demonstrations recently, it felt like those worries had reached a fever pitch and that the government might actually cave to public calls for military action. Sometimes it feels like a miracle that it hasn’t already happened. There are plenty of good reasons why China hasn’t invoked its military: The economic implications, the possibility of US military involvement, being perceived internationally as a belligerent bully. But there may be an even more compelling reason than any of these: The People’s Liberation Army (PLA) might not be up to the task. There seems to be a widespread assumption that without US-backing, militaries from Japan, Vietnam or Taiwan would fall swiftly to the overwhelming might of the world’s largest army. 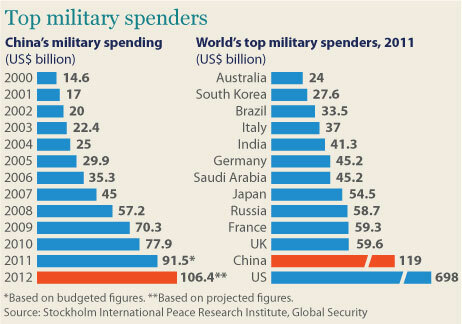 China’s military spending routinely increases by the double-digits, far outpacing its GDP growth. Last year that spending amounted to $91 billion – a 12.7% increase over the previous year. It’s expected to be $106 billion this year. Now I’m not a military expert by any means, but I have seen how major government monopolies tend to function in China. This might give us a better idea of the PLA’s capabilities than the raw numbers do. So let’s look at another major state monopoly: The Ministry of Railways. This is a fiefdom if there ever was one. The opaque ministry has its hand in everything vaguely related to or surrounding railways, from construction and manufacturing to hospitals and schools. Corruption and nepotism thrive. There was the $2.9 million promotional film where funds were funneled away, the SINGLE official who was able to embezzle $121 million, and the series of photos showing absurdly marked up bullet train items that resulted from government procurement. This week the ministry is back in the news as its $52 million online ticketing system continues to be worthless on the eve of another busy holiday. Netizens have demanded to know why the system cost so much, yet is worse than actually standing in line at the train station. If I may throw out some wild speculation (based on overwhelming precedent): Perhaps a chain of railway officials outsourced the site design to increasingly cheaper (AKA – decreasingly qualified) designers while pocketing the difference and/or gave contracts to personal connections for wildly inflated prices. Now shift back to the PLA, which is larger, more powerful and more secretive than the Ministry of Railways. So powerful and secret in fact that it operates as an entirely separate entity from civilian government and laws. People tend to see the huge annual PLA budget increases as a threat to China’s neighbors, but to a large extent it’s a way to quell the PLA’s danger to the Communist Party. Fear of a military coup has always weighed heavy on the party leadership and big budgets are one way of buying the military’s continued loyalty. It doesn’t take a big leap of faith to guess that a lot of that money is lost to corruption. In spite of its many scandals, the Ministry of Railways gets its job done for the most part…horrible inefficiency and occasional disasters aside. The public can see many of its failings, which keeps it a bit more honest and efficient than it otherwise might be. And if Hu Jintao decides to seriously clean house of corrupt railways officials, he doesn’t need to worry about tanks rolling up to his office the next day. With the PLA though, these things are all question marks. John Garnaut did a great article earlier this year based on inside sources trying to explain how pervasive and destructive corruption is in the PLA. The problem is that because of its enormous power and complete secrecy, it’s impossible for outsiders (and insiders for that matter) to appreciate the true scale and what it means for battle capability. With a naval/aerial engagement – which is what most potential conflicts would entail – victory would be decided more by hardware than troop numbers. It’s possible that even in the absence of US involvement, China’s military apparatus could falter when facing a presumably weaker opponent like Japan, or even Taiwan (See this in-depth analysis of a possible Sino-Japanese naval war). Neither option is very palatable, and the mere possibility of having to make that choice might be a major hedge against an all-out war.